Florida Democrats need to listen, and listen good. In 2010, Alex Sink lost the Gubernatorial election by a little over 61,000 votes. She should have won by at least 250,000 votes. The reason she didn’t is because South Florida didn’t turn out for her the way it normally does. Alex Sink didn’t spend much time in South Florida. We ended up with Rick Scott. Charlie Crist is going to suffer the same fate as Alex Sink, not because he doesn’t spend much time here, but because he won’t defend his positions (ever-changing), in a debate with his primary opponent, Nan Rich. He can’t be bothered to debate her and show Democrats why we should vote for him? The disrespect he has shown towards a woman who has dedicated her life to the Democratic Party is sickening, and the fact that Florida Democrats are allowing him to get away with it because he is shoveling money their way is even more sickening. I no longer will “take one for the Democratic Team” and look the other way. The group of democrats who feel this way is growing. It doesn’t matter what the polls say. What matters are the voters who always come out to vote like myself, who would rather stay home than vote for Charlie Crist. We will end up with Rick Scott again, if Crist can’t convince the women and minorities in South Florida that he isn’t just talking out of both sides of his mouth to get back into the political game. Those of us that find not having a primary debate unacceptable may not have the ability to shovel money towards the Florida Democratic Party, but we DO have the ability to not give them our vote. I watched Charlie Crist on To The Point with Michael Williams this morning, and it was just appalling. Michael did a great job of asking Crist about his various positions, and instead of answering, he simply picked another person to justify his actions. Whether it was The Pope, Jeb Bush, or President Obama, Chain-Gang Charlie couldn’t stand on his own two feet. He attributes his new-found beliefs to someone else, which leads me to ask, and SHOULD lead other democrats to ask, If someone else comes along, will Charlie change again because of that person, or opportunity?? At one point, Charlie got very testy, because his feet were put to the fire. That is the reason Crist won’t debate Rich. He won’t be able to deflect questions by summoning the name of Rick Scott because he can’t give a straight forward answer as to why he changed parties and positions. 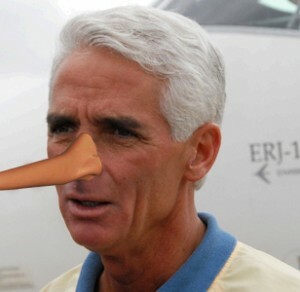 Did anyone pick up on the fact that when asked what would change if he becomes Governor again, Crist said “very little”? If very little is going to change, why are the Democratic Party Leaders putting all of their eggs in the Crist basket and hoping the rest of us will do the same? Crist says he left the Republican Party because they became anti-women and anti-minority? Stay tuned folks, I have a post coming up that addresses EXACTLY how Crist feels about minorities and women. While it is true that the Republican party is all of those things, so is CHARLIE CRIST. He thinks everyone has forgotten about the things he has done against minorities in the past, but some of us have not. This has never been about policy, position, or PEOPLE! It has always been, and will always be, about Charlie Crist for Charlie Crist. Crist knows that Democrats want to take the Governor’s mansion back so badly, that they are willing to sell their souls to the devil. Well the devil came to Broward County yesterday in the form of Charlie Crist. Sorry Charlie, but you can’t have my soul or my VOTE! I agree and thank you for your article. Let us clamor for a primary debate. My vote means a lot to me, and if the current Democrats don’t think they have to earn it, then they get what they get. I have absolutely no respect for anyone that turns their back on a dedicated supporter and champion for a Johnny-Come-Lately who has a “name”, especially when that “name” was followed by Republican all of his life. He won’t bother to at least debate her, I won’t bother to vote for him if he wins the primary. Trust and believe, there are a LOT of others who feel the same way. So instead of coming to me to lay the Rick Scott guilt trip, which doesn’t work by the way, why not ask Chain Gang Charlie why he won’t debate Nan Rich? When you do end up with Rick Scott for another four years, go to Crist and ask him why, but I’m sure he will have already hitched his star to yet another way to get back into the political game. Anything else you want to say? Yes, there is something else that I want to say. I gave out Nan Rich stickers tonight at the Broward County Black Caucus meeting in Plantation. I am an American I choose (Quoting Winston Churchill), “Never, Never, Never Give Up” my right to vote. Campaigns are sometimes nasty. I’m happy to hear that. I’m going to continue supporting Nan Rich. We must ALWAYS vote. Sitting home will help elect those we don’t like. Millie, I will be voting in the Primary, and whether or not I vote in the General will depend on the outcome. At the very least, we voters deserve a debate. At the VERY least. Oh, and for the record, I don’t like Charlie Crist.